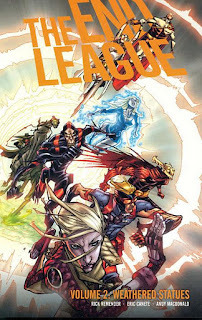 Synopsis: The End League are on the ropes as Dead Lexington summons Nargor'ri the Ravager to feast on the souls of those unfortunate masses of humanity still living in this nightmare world. Only Thor's enchanted hammer filled with the combined power of the dead Norse gods can possibly turn the tide. It's up for grabs, but can only be wielded by someone of pure intentions. Codename Black investigates a rumor that The Smiling Man has it in his possession. It's obviously a trap, but the options have run out for the final team of superheroes. Meanwhile Soldier American, The Prairie Ghost, and Blur Girl attempt to stop Dead Lexington, but must battle through Wolfsangel's group of Astonishman clones! What secret does Soldier American hide buried in his past causing him to doubt his worthiness to hold Thor's hammer? The deck is impossibly stacked against the heroes - how can they overcome evil and save the world this time! Pros: Remender's writing and characterization skills shine, Canete's art is highly detailed and competent, Baker's colors are great (especially her ability to color Canete's manic art style), some comedy too! Cons: Canete's art is highly stylized and gets a bit messy near the end of the series (reminds me of Carlos Meglia crossed with Keith Giffen), final issue drawn by MacDonald (not as exciting as Canete), Baker is replaced by Wilson after two issues (he's not as good), still just another post-apocalyptic, alternate-future knockoff of the Justice League! Mike Tells It Straight: The knockdown, drag out finish to Remender's diabolical Justice League ripoff holds nothing back. 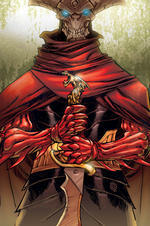 Canete's manic art is pulse-pounding, character origins are revealed, and this plot twists more than a suffocating mime. I thoroughly enjoyed the ride through this dark, crazy world and the ending was spectacular. The art gets a little rough and it would have been nice to have a consistent art team throughout, but definitely worth it.